Spirulina is a blue-green algae. Spirulina is a simple, one-celled form of algae that thrives in warm, alkaline fresh-water bodies. 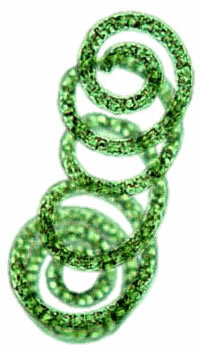 The name "spirulina" is derived from the Latin word for "helix" or "spiral", denoting the physical configuration of the organism when it forms swirling, microscopic strands. In addition, spirulina is one of the few plant sources of vitamin B12, usually found only in animal tissues. A teaspoon of spirulina supplies 2 1/2 times the Recommended Daily Allowance of vitamin B12 and contains over twice the amount of this vitamin found in an equivalent serving of liver. Even though it is single-celled, spirulina is relatively large, attaining sizes of 0.5 millimeters in length. This is about 100 times the size of most other algae, which makes some individual spirulina cells visible to the naked eye. Furthermore, the prolific reproductive capacity of the cells and their proclivity to adhere in colonies makes spirulina a large and easily gathered plant mass. The algae are differentiated according to predominating colorations, and are divided into blue-green, green, red, and brown. Spirulina is one of the blue-green algae due to the presence of both chlorophyll (green) and phycocyanin (blue) pigments in its cellular structure. Even though spirulina is distantly related to the kelp algae, it is not a sea plant. However, the fresh-water ponds and lakes spirulina favors are notably more saline, in the range of 8 to 11 pH, than ordinary lakes and cannot sustain any other forms of microorganisms. In addition, spirulina thrives in very warm waters of 32 to 45 degrees C (approximately 85 to 112 degrees F), and has even survived in temperatures of 60 degrees C (140 degrees F). Certain desert-adapted species will survive when their pond habitats evaporate in the intense sun, drying to a dormant state on rocks as hot as 70 degrees Centigrade (160 degrees F). In this dormant condition, the naturally blue-green algae turns a frosted white and develops a sweet flavor as its 71 percent protein structure is transformed into polysaccharide sugars by the heat. Some scientists speculate that the "manna" of the wandering Israelites, which appeared miraculously on rocks following a devastating dry spell and was described as tasting "like wafers made with honey" may have been a form of dried, dormant spirulina. This ability of spirulina to grow in hot and alkaline environments ensures its hygienic status, as no other organisms can survive to pollute the waters in which this algae thrives. Unlike the stereotypical association of microorganisms with "germs" and "scum", spirulina is in fact one of the cleanest, most naturally sterile foods found in nature. Its adaptation to heat also assures that spirulina retains its nutritional value when subject to high temperatures during processing and shelf storage, unlike many plant foods that rapidly deteriorate at high temperatures. Spirulina is also unusual among algae because it is a "nuclear plant", meaning it is on the developmental cusp between plants and animals. It is considered somewhat above plants because it does not have the hard cellulose membranes characteristic of plant cells, nor does it have a well-defined nucleus. Yet spirulina's metabolic system is based on photosynthesis, a process of direct food energy production utilizing sunlight and chlorophyll, which is typical of plant life forms. In essence, Spirulina straddles that fork in evolutionary development when the plant and animal kingdoms differentiated. Thus spirulina embodies the simplest form of life. In contrast, other algae such as Chlorella have developed the hard indigestible walls characteristic of plants. Why has spirulina been called a superfood? Because it contains the most remarkable concentration of nutrients known in any food, plant, grain or herb. Its the highest protein food- over 60% all digestible vegetable protein. It has the highest concentration of beta carotene, vitamin B-12, iron and trace minerals and the rare essential fatty acid GLA. These make spirulina a great whole food alternative to isolated vitamin and minerals. The scientific research with spirulina identifies some unusual health giving phytonutrients. What are they? Spirulina's dark color comes from a rainbow of natural pigments. They harvest sunlight at different wavelengths and protect from too much sun. These pigments offer unusual health benefits and help synthesize many enzymes necessary for regulating body metabolism. They are chlorophyll (green), carotenoids (yellow and orange) and phycocyanin (blue), the dominant color. I know Beta Carotene is an anti-cancer antioxidant nutrient. Is natural different than synthetic beta carotene? Spirulina is the richest Beta Carotene food, with a full spectrum of ten mixed carotenoids. About half are orange carotenes: alpha, beta and gamma and half are yellow xanthophylls. They work synergistically at different sites in our body to enhance antioxidant protection. What is so unique about spirulina as a source of GLA? A food source of GLA is important, especially for women. Known GLA foods are mother's milk and oil extracts of evening primrose, black currant and borage seeds. Spirulina is a potent source, an astonishing 1% by weight! Eight spirulina tablets contain equivalent GLA to a capsule of primrose oil. I've heard from many women who have appreciated spirulina's benefits for PMS and for healthy, beautiful skin. How much should people take and when should they take it? Long time consumers and scientific evidence both suggest 2-5 grams a day bring significant health benefits. Take it every day for best results. Because spirulina is a whole food, you can take it alone or with meals. Mix spirulina powder in a fruit juice smoothie as an instant breakfast, or in a vegetable juice smoothie in the afternoon. What are the benefits for an aging population? Spirulina is an ideal anti-aging food: concentrated nutrient value, easily digested and loaded with antioxidants. 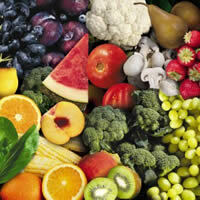 Beta Carotene is good for healthy eyes and vision. This all vegetable, low fat protein means we can lighten up on a meat centered diet that can aggravate arthritis and raise cholesterol. When we choose to eat less meat, vegetables like spirulina are good sources of more iron and essential minerals. As people age, many who don't eat enough, have restricted diets or poor digestion may experience low energy from being undernourished. Spirulina builds healthy lactobacillus, aiding assimilation and elimination and relieving constipation. Older people really notice an energy boost. In Japan, 73% of those taking spirulina are over 50 years old! Is spirulina good for pets and other animals? Yes. Walk into any pet store and you'll find it's a popular supplement for fish, birds and pets. In fact, much of the global spirulina production is consumed by aquaculture raised fish and prawns, tropical fish, ornamental birds, horses and even cats and dogs. In the 1970s, the first use was enhancing the beautiful colors in fancy koi carp. Then fish and prawn farmers discovered it increased growth rates, survival, color, and reduced medications. Today, spirulina is in most premium aquarium feeds. Zoos feed their flamingos a spirulina diet, like the millions of pink flamingos living on it in East African lakes. Ornamental bird breeders use it to enhance color, health and fertility. Tiny amounts in diets of young turkeys and chickens builds disease resistance, reducing the need for antibiotics. In reptiles, it improves skin gloss and disease resistance. For thoroughbred racehorses, it improves speed and recovery. If you give spirulina to your dog or cat, you'll notice healthier skin, lustrous coat and fresher breath. Older animals may regain their flexibility. It's not unusual for a pet owner to ask: "Is spirulina good for me, too?" (SACRAMENTO, Calif.) Adding spirulina to cultured immune system cells significantly increases the production of infection fighting cytokines, say immunologists at UC Davis School of Medicine and Medical Center. Their finding is published in the Fall issue of the Journal of Medicinal Foods. Spirulina are blue-green algae rich in antioxidants, vitamins, minerals and other nutrients. Used as a food supplement for more than 20 years, spirulina grows naturally in lakes with extremely high pH levels, but it is also harvested from large-scale commercial ponds, where purity is monitored before being dried and distributed in tablet and powdered form. A number of animal studies have shown spirulina to be an effective immunomodulator (an agent that can effect the behavior of immune cells.) In rats, spirulina inhibited allergic reactions by suppressing the release of histamine in a dose-dependent fashion. In cats, spirulina enhanced the ability of macrophages to engulf bacteria, and in chickens spirulina increased antibody responses and the activity of natural killer cells, which destroy infected and cancerous cells in the body. While extensive human studies have not been done, several reports also suggest spirulina has therapeutic effects on hyperlipidemia and obesity. In one study, spirulina decreased total serum cholesterol and low-density lipoprotein cholesterol, while increasing high-density lipoprotein. A 1986 study of obese patients showed a significant reduction of body weight after including spirulina in the diet for four weeks. In the UC Davis study, researchers evaluated the secretion of the cytokines interferon-gamma, interleukin-4, and interleukin-1beta in the lab to get a better understanding of spirulina's potential regulatory effect on the immune system. "We found that nutrient-rich spirulina is a potent inducer of interferon-gamma (13.6-fold increase) and a moderate stimulator of both interleukin-4 and interleukin-1beta (3.3-fold increase)," says Eric Gershwin, professor and chief of the Division of Rheumatology, Allergy and Clinical Immunology at UC Davis. "Together, increases in these cytokines suggest that spirulina is a strong proponent for protecting against intracellular pathogens and parasites and can potentially increase the expression of agents that stimulate inflammation, which also helps to protect the body against infectious and potentially harmful micro-organisms. Additional studies with individuals consuming spirulina are needed to determine whether these dramatic effects extend beyond the laboratory." In the body, the preferential increase in the production of interferon-gamma over interleukin-4 would shift the immune system towards mounting a cell-mediated immune response instead of a humoral response. A cell-mediated response includes the activation of T-cells and antibodies that work with macrophages, another type of immune system cell, to engulf invading micro-organisms. Hence, spirulina's strength in protecting against intracellular pathogens and parasites. The moderate increase in the secretion of interleukin-1beta, a cytokine that acts on nearly every cell of the body to promote inflammation, works to support the overall immune response. "People have used foods like yogurt and spirulina throughout history," says Judy van de Water, associate professor of rheumatology, allergy and clinical immunology at UC Davis. "Through research, we are learning exactly how these foods improve immune system function and how they are a beneficial addition to our diet." This research was funded in part by a grant from Earthrise Nutritionals, Inc., and the National Institutes of Health. Millions of people worldwide eat spirulina cultivated in scientifically designed algae farms. Current world production of spirulina for human consumption is more than 1,000 metric tons annually. The United States leads world production followed by Thailand, India and China. More countries are planning production as they realize it is a valuable strategic resource. Spirulina is not chlorella, nor is it the blue-green algae harvested from Klamath Lake, Oregon. Chlorella, a green micro-algae, is a nutritious food but does not have the same anti-viral, anti-cancer and immune stimulating properties of spirulina. The chlorella cell wall is made of indigestible cellulose, just like green grass, while the cell wall of spirulina is made of complexed proteins and sugars. The Klamath Lake blue-green algae has the scientific name Aphanizomenon flos-aquae. There are serious concerns about the safety of eating it because it can sometimes contain potent nerve toxins. While the scientific literature is full of information concerning the toxicity of A. flos-aquae and its dangers to humans and animals, there are few, if any, peer reviewed scientific papers regarding therapeutic benefit. In contrast, the scientific literature is full of information concerning the benefits and safety of humans and animals eating chlorella and spirulina. In vitro studies suggest the unique polysaccharides of spirulina enhance cell nucleus enzyme activity and DNA repair synthesis. This may be why several scientific studies, observing human tobacco users and experimental cancers in animals, report high levels of suppression of several important types of cancer after being fed whole spirulina or treated with its water extracts. Spirulina is a powerful tonic for the immune system. In scientific studies of mice, hamsters, chickens, turkeys, cats and fish, spirulina consistently improves immune system function. Medical scientists find that spirulina not only stimulates the immune system, it actually enhances the body's ability to generate new blood cells. Evaluation of Chemoprevention of Oral Cancer with Spirulina. By Babu, M. et al. 1995. Pub. in Nutrition and Cancer, Vol. 24, No. 2, 197-202. India. Enhancement of endonuclease activity and repair DNA synthesis by polysaccharide of spirulina. by Qishen, P. et al. 1988. Pub. in Chinese Genetics Journal 15 (5) 374-381. China. Inhibition of experimental oral carcinogenesis by topical beta carotene. by Schwartz, et al. 1986. Harvard School of Dental Medicine. Pub. in Carcinogenesis, May 1986 7(5) 711-715. USA. Beta carotene was found to significantly inhibit the formation of squamous cell carcinoma of hamster buccal pouch when a soultion was applied topically three times weekly for 22 weeks in an experiment with 40 hamsters. In a second experiment with 80 hamsters, beta carotene was found to inhibit oral carcinogenesis in an initiation-promotion hamster buccal pouch system. Beta carotene in hibited both initation and promotion. Prevention of experimental oral cancer by extracts of spirulina-dunaliella algae. by J. Schwartz, G. Shklar, et al. 1988. Harvard School of Dental Medicine. Pub. in Nutrition and Cancer 11, 127-134. 1988. USA. Bioavailability of spirulina carotenes in preschool children. by V. Annapurna, et al. 1991. National Institute of Nutrition, Hyderabad, India. J. Clin. Biochem Nutrition. 10 145-151. India. Large scale nutritional supplementation with spirulina alga. by C.V. Seshadri. 1993. All India Coordinated Project on Spirulina. Shri Amm Murugappa Chettiar Research Center (MCRC) Madras, India.